We heard some rain this morning before we got up, and it was 49 degrees when we started stirring around. I’ve said it before but we’ve had such good weather on this trip it’s hard to believe our luck. We’ve driven through a couple of small showers, but the rain seems to be “over there” and not where we are. 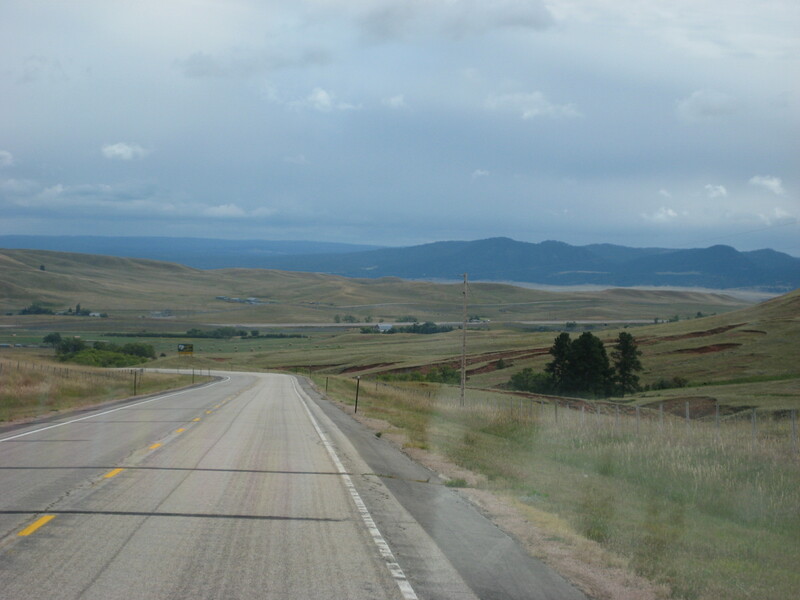 We left Sheridan, Wyoming this morning, and the “Peter D’s RV Park”. What a great little private park. It was very level, had very clean restrooms/showers, and we had all the amenities we wanted–cable TV, WIFI, and full hookups. The owner, Peter, was so personable and we really enjoyed talking with him. He wanted to make sure our stay was a pleasant one, and it sure was. 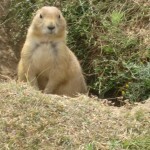 On the road this morning we saw all sorts of wildlife which thrilled Greg. We saw wild turkey, and lots of wild antelope in the fields. We tried taking photos, but they are the same color as the fields and it is hard to spot them. 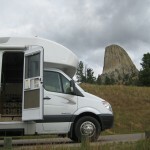 We arrived at the Devil’s Tower National Monument around lunch time and had lunch while here. 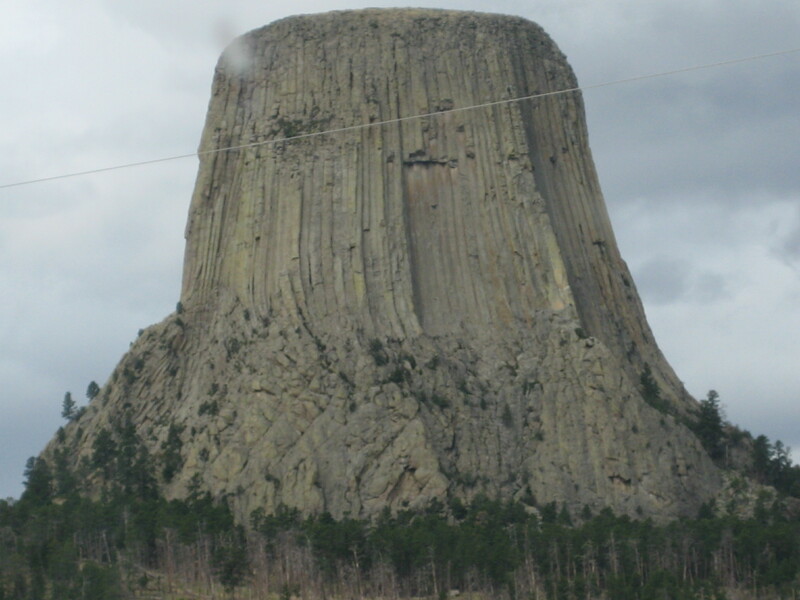 The legend of the Devil’s Tower is that of the Kiowa indians: eight children (seven sisters and their brother) were playing and the brother suddenly was struck dumb; he trembled and began to run on his hands and feet. His fingers became claws and his body was covered with fur. Directly there was a bear where the boy had been. The sisters were terrified; they ran and the bear ran after them. They came to the stump of a great tree, and the tree spoke to them. It told them to climb upon it, and as they did so, it began to rise in the air. The bear came to kill them, but they were just beyond it’s reach. It reared upon the tree and scored the bark all around with it’s claws. The seven sisters were borne into the sky, and they became the stars of the Big Dipper. 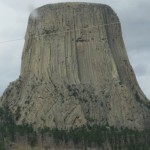 It was named Devil’s Tower in 1875, and became the first national monument in 1906 (by Theodore Roosevelt). From the photo you will see the scoring around the monument. It was an imposing sight to see. 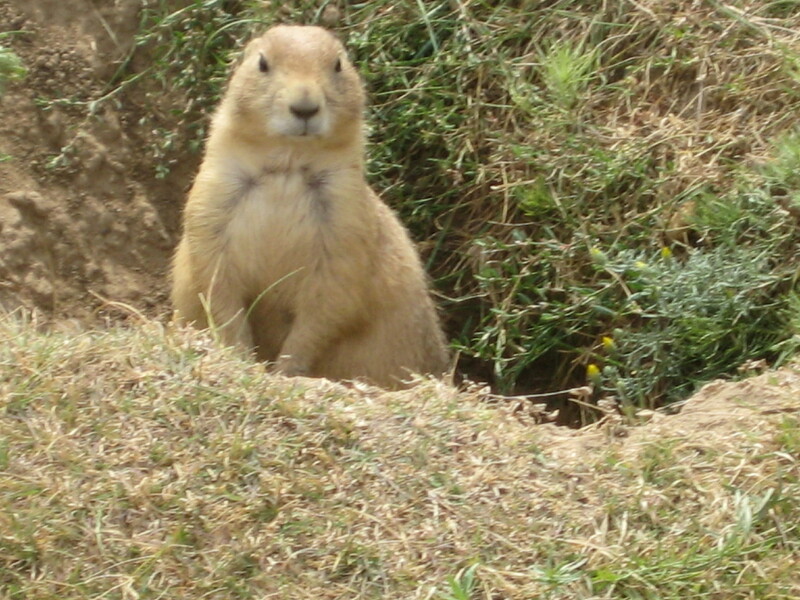 For some reason, prairie dogs are abundant at the base of this rock mountain and people can get very close to them. 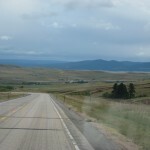 We continued on our way through Spearfish, South Dakota, and then on into Sturgis, South Dakota, the home of the famous Sturgis motorcycle rally every August. We saw the main street where all the motorcycles park during the rally. It’s basically a ghost town now, with hardly anyone around. Still interesting to drive down this famous street. When we stopped for gas in Sturgis, I figured our mileage and we have driven 4,000 miles to date! 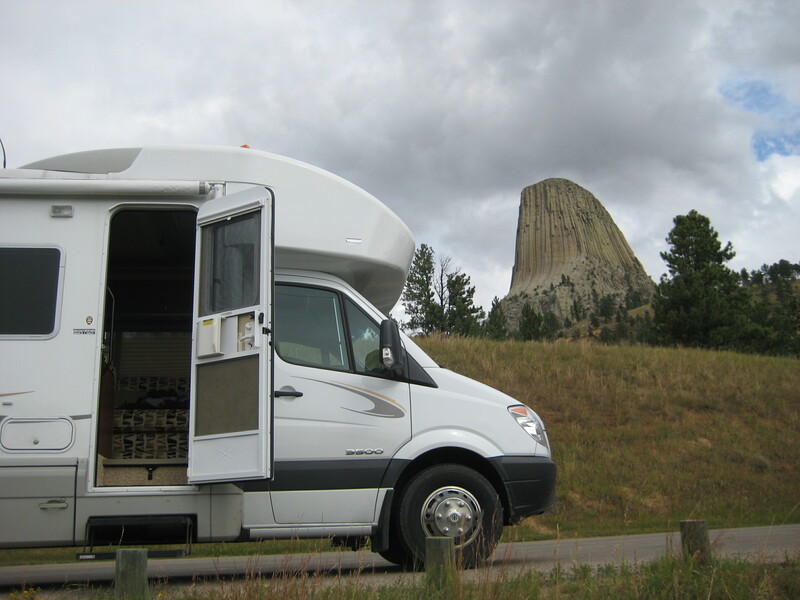 We arrived in Rapid City, South Dakota, around 3:30 p.m. and we are staying in a nice little campground called Happy Holiday RV Park which is near Mt. Rushmore. The note at the entrance says “Frowns are not allowed at this campground. If you feel compelled to have one, leave it at the dump station and pick it up when you leave”. 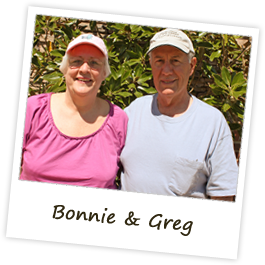 Now, didn’t we tell you that retired RVers are the happiest folks around? Just about the time Greg finished hooking up our electricity and water, we had a little downpour of rain. But that’s fine—we are comfy in our RV and will have a nice dinner of veggie ravioli with meat sauce, and a fresh salad, and for dessert, my home made sour cream pound cake. Greg’s a happy camper. We will continue east across South Dakota tomorrow with our goal of getting to the Winnebago Plant in Forest City, Iowa, by Monday evening. Stay tuned.